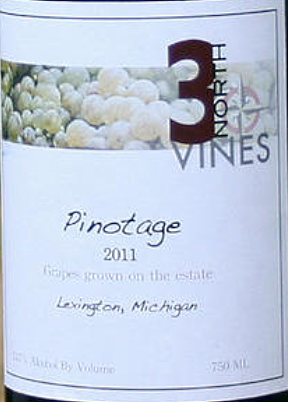 3 North Vines is a new estate near Lexington, Michigan which has planted two varieties new to the region. One of these is Pinotage which in 2009 they first to plant in Michigan and 2011 saw their first Pinotage vintage. Owner Nate Shopbell tells me that he fell in love with Pinotage after visiting Kanonkop Estate and many others when he visited South Africa in 2006. "We have been growing about an acre of Pinotage which we had grafted ourselves onto rootstock that we planted in 2009," he says. "We have been really happy with our wine quality from our two harvests so far of those vines. This past winter was a particularly harsh one for the Midwest and unfortunately I have a fair amount of loss both from Crown Gall and winter cold damage."